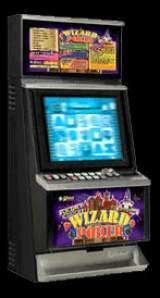 Wizard Poker © 200? Global Gaming. Free Game Feature : After the last draw. 'Four of a Kind' or better will trigger a 10 Free Games Feature. Third Draw Feature : After the second draw, any 2 pairs without Joker will trigger the third draw feature which gives the player one more chance to re-draw the cards. Lottery Feature : After the last draw, if 3 to 5 consecutive suits match with3 to 5 consecutive suits from 5 suits which randomly appears on the lottery suit table, The bonus credit will be paid as per lottery table. Blackjack Feature : If a winning combinations in the second draw is generated from a winning combination from the first draw, the Blackjack Feature is triggered. If the player beats the dealer the current winning amount will be four times with the blackjack win and tripled with other wins. If the game is a tie the current amount will be doubled otherwise the win will be paid as normal.